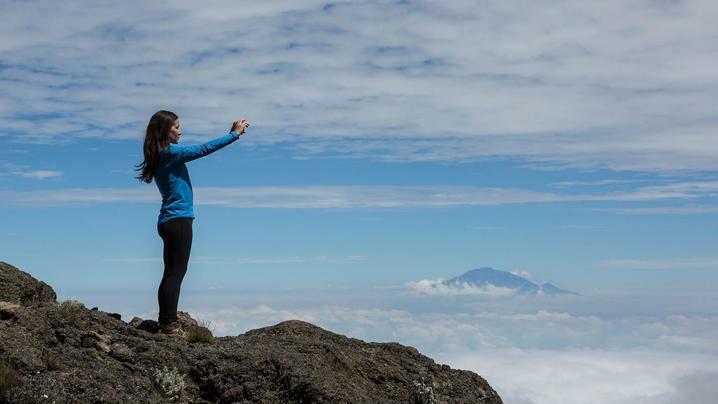 Possibly the most scenic route to the summit, Machame boasts several paths to its highest point and back. 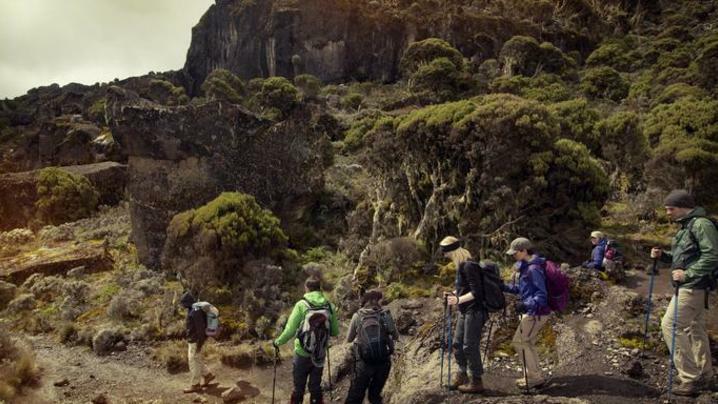 En route to Uhuru, emerge onto high-alpine deserts with amazing views of ice fields and the peak of Mt Kilimanjaro! Known as the "Whiskey Route" because of the tougher challenge, this path leads you through magnificent forests before traversing a ridge leading through moorland to the Shira Plateau. 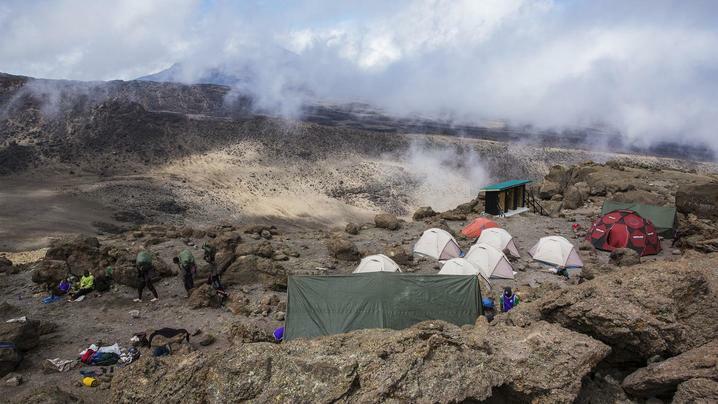 It offers great scenery beneath the glaciated precipices of the southern ice fields before summiting from the higher Barafu Camp. Camp along the route with support from local guides and porters. Most of the day is spent in the gorgeous and fascinating, forested slopes of Mt. Kilimanjaro, most of which is considered to be rainforest zone. Depending on the weather, the trail will be soggy and possibly muddy if it rains. 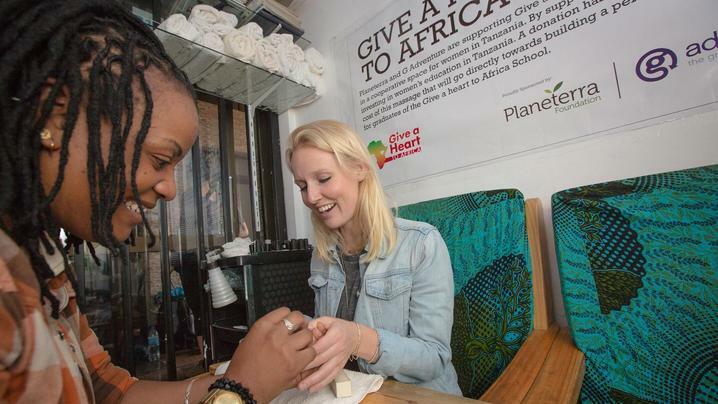 The idea of camping in Africa can be a daunting one. For those not accustomed to ‘roughing it’ for a few days we offer a full camping service. All tents are pitched for you, meals are prepared and served and the washing up is done by staff. This leaves you with more time to enjoy your surroundings and is ideal for first-time campers who may be worried about the challenges such a trip can entail. When camping we are exposed to the elements, and whilst there are times when the weather is fine and temperatures are pleasant, there may be days when it is foggy, rainy and cool. In certain locations there may also be a number of bugs. These factors, however, should be seen as minor downsides to a camping experience which will allow you to get up close to the beautiful nature that Africa has to offer. All camping equipment (with the exception of your sleeping bag and pillow) is supplied. We supply canvas dome tents with built-in mesh insect nets on the doors and windows. Mattresses are also available, which are approximately 4cm thick, warm and comfortable. While on the mountain (7 nights), we provide full-service alpine camping at designated communal campsites. 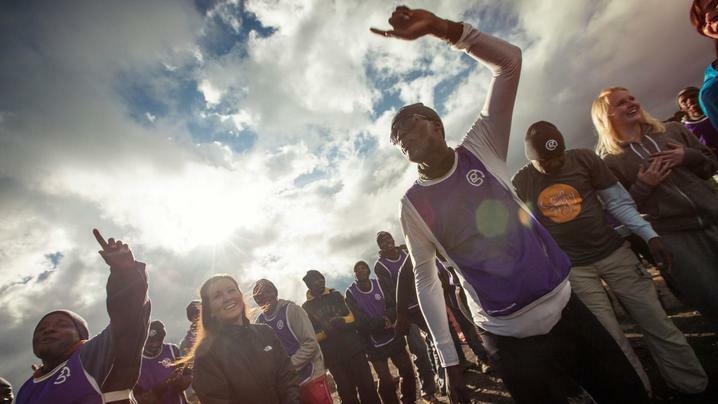 Your porters will be carrying your tents, which they will pitch for you at these sites. The campsites are fairly basic, and exposed to the elements. 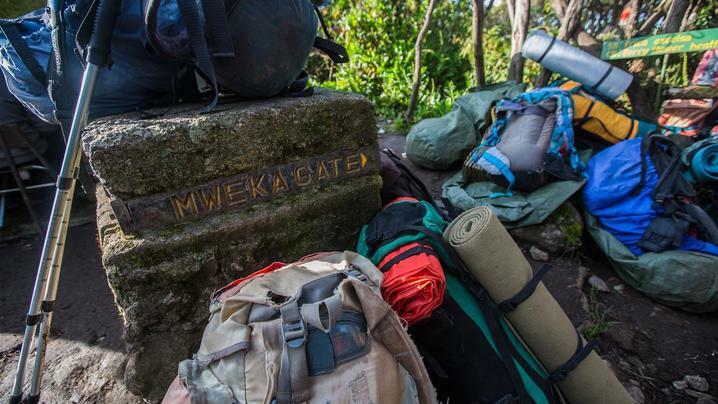 They will not have electricity, nor shower facilities, and toilet facilities are basic long drop latrines, which could become dirty at times (especially when it is raining), as many other hikers sharing the same facilities. Your crew will prepare basins of warm water for washing daily. All camping equipment (with the exception of your sleeping bag and pillow) is supplied. All meals on the mountain will be prepared for you by your group's cook. The tents are two-person dome tents which are assembled by the porters. All tents have built-in insect nets. Mattresses are also provided, which are warm and comfortable. 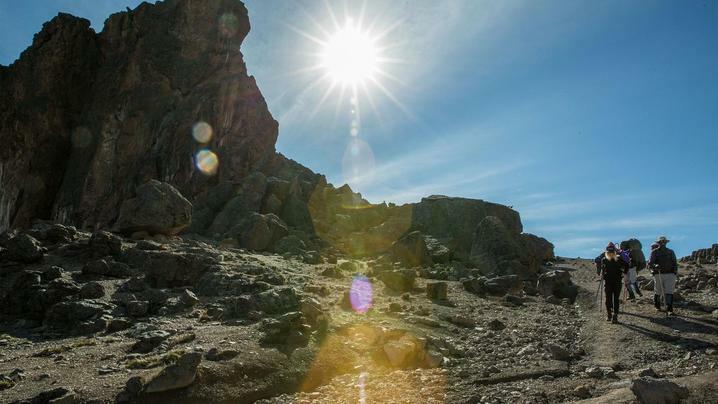 This trek is not for the faint of heart, and the camp sites on Mt. Kilimanjaro are basic. However, many come out of their camping experience on the world’s largest free-standing mountain not only gratified, but ultimately rejuvenated by such an experience of a lifetime. Please note, if you need to alter the itinerary for any reason (e.g. 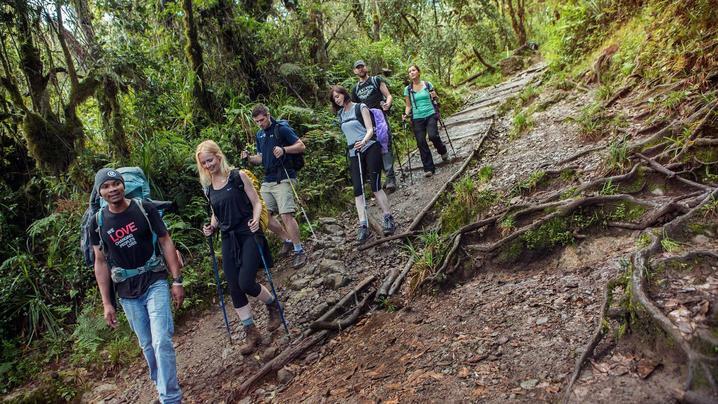 travel delay or illness or in the event of having to descend from your climb early due to altitude sickness, injury or exhaustion), any unscheduled meals or nights spent in a location other than the tour itinerary will be at your own expense. The start/end hotel has a number of services and facilities available as follows; Internet, laundry, gear hire, luggage storage, telephone services, TV lounge, outdoor dining area and a shuttle service to/from Moshi as the hotel is located just a few kilometers from the centre of town.